“Fake news” is a term that has exploded in popularity recently. It is often used to describe articles and memes that have been deliberately fabricated to manipulate opinion or misinform. Many educators prefer to concentrate on developing critical media literacy skills in students rather than buying into a debate over whether news is fake or not. However, I want the title of my article today to reflect what people may use in a Search. Librarians and teacher librarians are experts in helping kids detect and avoid fakery so be sure to ask them for help. But if you don’t have such an expert handy, or you’re looking for a checklist and a PDF infographic to help kids start analysing a website, let’s go! * How does the website look? Are there lots of ads, or sensational images that may have been faked? * Does the story push only one idea, and is that idea wacky? * Does the story have poor spelling and overdone punctuation? Sometimes this can indicate a source you can’t trust. 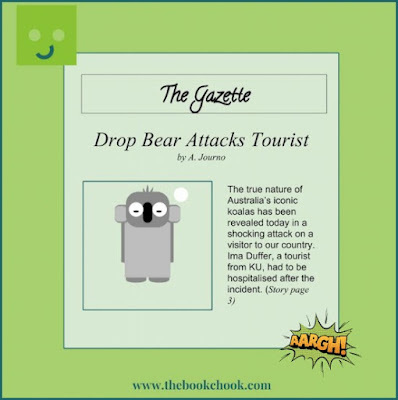 Look for overuse of exclamation marks, words in all capital letters, weak grammar skills. * Dig deeper. Search to investigate the site. Check out the About page or section. Is the url one to trust, or be wary of? Sometimes urls look similar to legitimate ones to try to trick people. * Investigate the author. Search their name. If there’s no author name at all, that can be a sign of a fake site. * Get past the headline. What’s the whole story? * Check out the links and sources. Do they support the story? If there are no reliable sources mentioned, an article might just be someone’s opinion, or a lie. * Check any dates. People can twist a story and fake a date. * Did the story start out as a joke or satire? Is it a hoax? Is it on other news sites? * Are you biased? Is this something you WANT to believe? * Ask librarians or use fact-checking sites. Thanks to FactCheck for the tips above which I have tried to simplify. 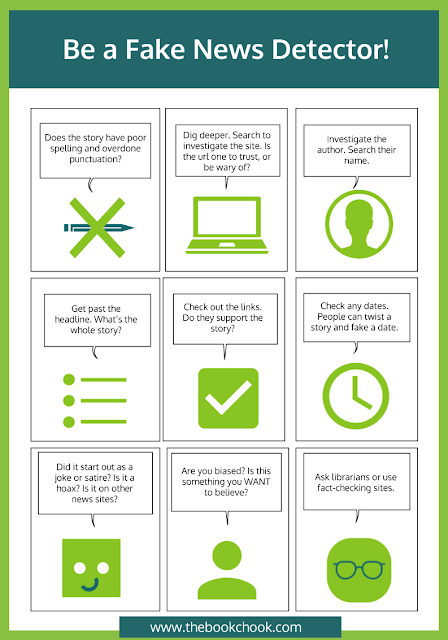 Below is an image of a PDF infographic called Be A Fake News Detector! that I’ve created. It may help kids look for clues as to whether a website is reliable or not, and is based on the tips above. If you’re a parent, teacher or librarian who works with kids, you can find it and download it for free via my website. Note: Kids need supervision online and lots of guidance navigating the internet. Some of the sites mentioned here may have content not suitable for kids. Do take advantage of incidental moments with kids, whether online or with any media, to have them reflect on a communication - what is its purpose and who is the target audience? + My tips above are mostly based on an article at the Fact Check website which investigates and helps us detect fakery. + First Draft is a project set up to fight misinformation and disinformation online. Although mostly aimed at journalists and journalism students, it has many helpful resources for anyone interested in media literacy. + SNOPES is a website where you can find not just political, but a range of stories that have been investigated and pronounced untrue. + Nowadays, not just text but many images are deliberately manipulated and spread to misinform. I have chosen to concentrate on text here but Tin Eye Reverse Image Search is one tool that can help discover where an image first appeared. + Factitious is a game where you get to read and decide if news is fake or not. + The FART test is one way of figuring if a website smells off. For some reason this acronym very much appeals to students. 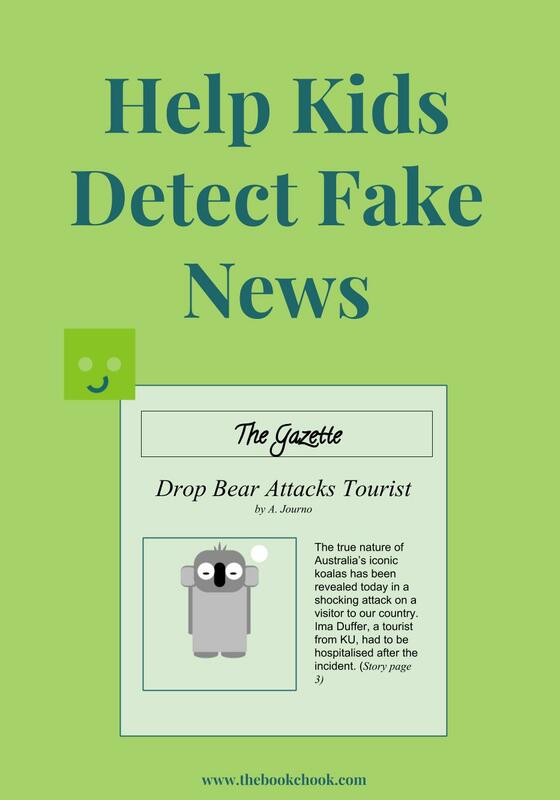 + It can be useful to have students look at websites that have been deliberately set up as fake, but also as teaching tools to help kids learn about fakery. Some I have seen recommended are Pacific Northwest Tree Octopus, All About Explorers, and Dog Island. Can students come up with their own creative ideas to persuade others something fake is true? 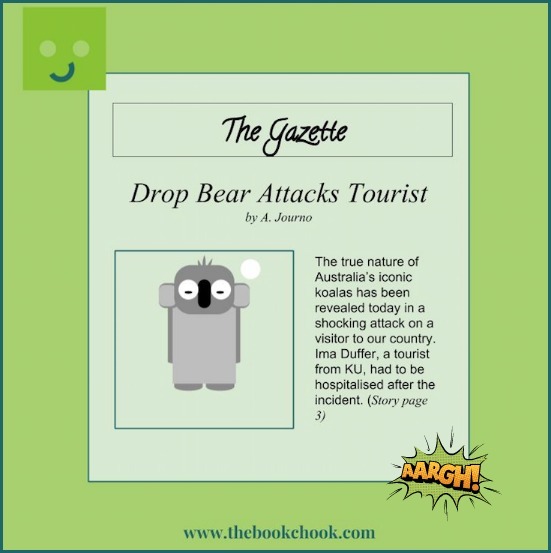 I don't believe it trivialises a serious subject to have some fun with it, so I've added my own contribution about drop bears as one example below. Thanks! It was tricky choosing points to fit, and leaving some points out was hard too! But I hope this can be a discussion starter at least.